Windhoek — President Hage Geingob, in his capacity as chairperson of the Southern African Development Community (Sadc), recently met former Botswana President Ian Khama over the widely publicised running feud with his successor Mokgweetsi Masisi, reports City Press. Khama himself revealed this in an interview with the South African Sunday newspaper in Johannesburg on Friday. The Namibian presidency's Press Secretary, Dr Alfredo Hengari, yesterday confirmed the meeting between Geingob and Khama. Khama, according to the City Press, was preparing to catch a flight to attend an event in India - at Dharamshala, the residence of exiled Tibetan spiritual leader, His Holiness the Dalai Lama, and the headquarters of the Tibetan government in exile. According to the paper, Khama said he was invited to attend a meeting at the Sadc headquarters in Gaborone, Botswana, when Geingob paid a familiarisation visit recently. Geingob undertook the trip to enable him, as Sadc chairperson, to appreciate the work done by the secretariat in facilitating the organisation of the regional agenda and to provide guidance on the secretariat's implementation. "He asked to see me so I can give my side of the story," the paper quoted Khama as saying. "He expressed concern as a neighbour, as the chairman of the Sadc and as the president in the region. He expressed concern [about Botswana] precisely because of what we have been saying: that this is not what we expect of Botswana," it added. "I feel guilty because I am caught right in the middle of this on-going problem, after having tried to move Botswana up the ladder in all areas. Now to have this thing, this burden..." Khama said, according to City Press. Khama relinquished his position, as the president of Botswana, in April 2018 after serving the maximum 10 years in office, to pave way for his former deputy, now President Mokgweetsi Masisi. Nonetheless, the two men have since fallen out in a public spat that threatens to undermine Botswana's carefully crafted reputation for stable government. 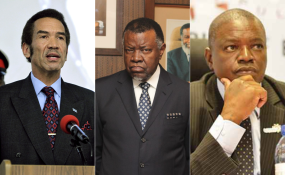 At the centre of this instability has been political bickering between Masisi and Khama, who has publicly pronounced his support for ex-foreign Minister Pelonomi Venson-Moitoi to contest Masisi for the presidency of the governing Botswana Democratic Party (BDP). The BDP will hold its elective congress in May where, for the first time, the party's presidency will be contested.